September 19, 2014 – Arrr, plunder ye this Tegan and Sara, Billy Joel, RB Harrrmonies Project, or more booty still! Note: Preview videos be choppy seas, and may harrrbor some song issues the cap’ns haven’t yet swabbed out. Ye’d best be treatin’ them only as previews, or ye’ll be used as ballast. First mate Lowlander has the hon-arrr of preparin’ the crew’s videos. A red X be markin’ the treasure of Pro Guitar/Pro Bass charrrts, a blue M is meanin’ full multitracks, a blue K flies the “karaoke” standard (separrrated vocals), and a rusty 2x means ye’ll not be searchin’ long for a 2x Bass Pedal version. Avast! Know ye what day it is, bilge rats? It be Septembarrr 19, Talk Like a Pirate Day! Don yer tricorner hats, grip a cutlass between yer teeth, grab a buxom lass (or fetchin’ lad) in one arrrm, and prepare to board the ship o’ Rock Band treasures with th’ other! Ye’d think there’d be a treasuarrr trove of rock starrr pirate images on the Seven Seas o’ Google, but me one good eye spotted very few. Dejected “arrr”. Now, it’s not only bein’ Talk Like a Pirate Day, but also the barrrthday of the fine lasses Tegan and Sara! 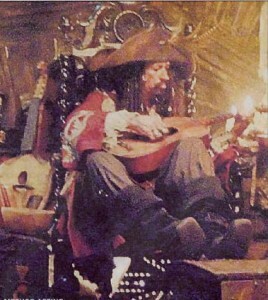 Give ’em a yo ho ho and/or a bottle o’ rum as you play these songs, or suffer a terrible curse. If ye be thinkin’ that Tegan and Sara be too much like hipstarrr music, try yer hand at Billy Joel, or perhaps two pirate-themed(-ish) shanties. We’ve plenty o’ loot to go around, ye scoundrels! But what’s a pirate shanty without some harrrmonizing? espharrr is here with H3ADShOt3 to set yer peg-leg tappin’ to 22 RBHP upgrades, including Bob Marrrley and the Wailarrrs! (Aye, have I mentioned “arrr” yet, me lovelies?) Get ye to the bottom of this cap’n’s log fer the full list, and sail to the Isle of RBHP to be claimin’ ’em fer yer own. We’ll be seein’ yer sorry hides next Friday! Yarrr! Download these here harrrmony upgrades at yon RBHP site. Blondie – “Call Me” – Added harmonies to PG/PB upgrade. September 12, 2014 – Five legends without their bands! September 26, 2014 – Metal Origins 5-pack! Thanks Nightmare Lyra, drummerockband and mazegeek999. Not my kind of songs, but awesome job. More Tegan and Sara?! Amazing work all involved! I sang these asap. Excited to try pro keys on I Was a Fool. Thanks for the work! Delighted for more T&S (got into them since The LEGO Movie & The Con (song). please please guys! take more gh6 song children of bodom and “bloodlines” of dethklok!. your work is amazing!